Phoenix-based KatzDesignGroup recently served up three restaurant interior projects in bustling Downtown Phoenix ranging from a fast-casual eatery at CityScape to an upscale Italian dining establishment at Collier Center. 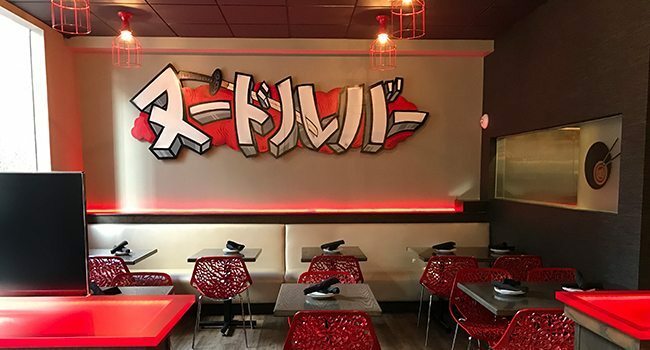 Yogi’s Grill, CityScape, 1 E. Washington St., 1,200 square feet: Phoenix-based KatzDesignGroup designed the first of the newly branded Yogi’s Grill – Teriyaki & Roll fast casual restaurants, this one at CityScape. The 12th location of the franchise brings in a newly branded interior with a variety of unique materials. The counter has a combination of granite and “burnt” wood. Millworker URI Construction repurposed pieces of salvaged wood for several weeks to create the mixed wood panels in the 250 SF dining area. The next location at Rivulon in Gilbert is scheduled to open in February. Mancuso’s Restaurant, Collier Center, 201 E. Washington St., 8,700 SF: Katz partnered with Pasadena Ave. Design to create Bob Mancuso’s next venture. The space celebrates the restaurant’s 35-year Phoenix history with family heirlooms and photographs. It is inspired by Northern Italian cuisine and design. The restaurant features a custom map of the town in Northern Italy where the Mancuso family lived as a backdrop for the new host area. .
Other design features are Italian tiles, bento box counters, artist-inspired visual graphics, and the graphic branding by AWE Collective. Partner architect was Michael Hall; Bill Plesher of Landmark Kitchen Design provided additional design. General contractor was De Novo Construction.